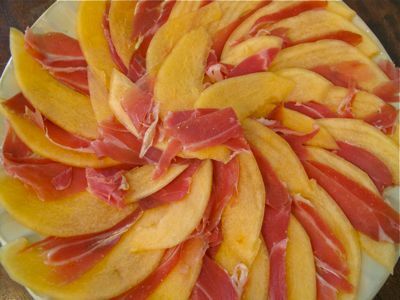 This is a classic Italian pairing of salty and unctuously rich prosciutto with sweet melon that is a favorite in the Marketman & Family household. It is incredibly easy to make and always pleases guests over for a casual Italian style meal. First purchase some good Prosciutto di Parma that is sliced painfully thin at your favorite delicatessen. We had the remnants of a whole prosciutto in our fridge, so we simply sliced this into a medium thick (our home electric slicer isn’t as good as a deli version), relatively small pieces. Next, I also sliced half of a peeled cantaloupe, using the electric slicer, making long thin arcs of melon. 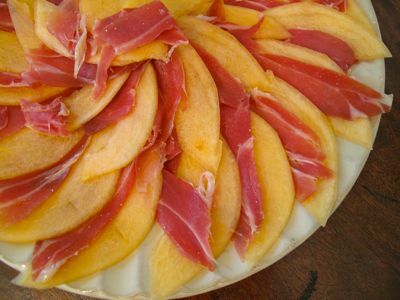 If you can’t find a good melon, and have stunning chicos (they are in season now) instead, they make an interesting pairing with prosciutto as well, see here. Enjoy! So, MM what was the secondi? or the rest of the Italian feast? Did you make panna cota too? Yummy! I had a whole cantaloupe sitting on the counter and some leftover prosciutto but somehow ended up wolfing down three rib-eye tacos with a salsa I made from grilled leftover toms and a few buds of fresh oregano..you inspire me nonetheless. I’ve been eating so much rice and need to reclaim my tummy, hence the tacos. I am on a losing streak, hahahahaha.. A dear friend is visiting Paris right now and had a craving for sweets and emailed asking for information, pronto! All I had to do was send him the links to your posts on some Paris’ sweet food haunts.. that should fix it. Have a great Sunday, MM! 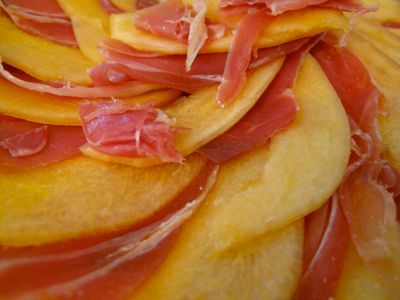 Squeeze of lime or lemon would be good, too on top of the melon and prosciutto. ill try this one, so easy! hehehe now, if only the malls would be opened tomorrow then i could get the prosciutto. Marketman prefers italian prosciutto instead of spanish jamon serrano? have tried this using honeydew and like sister a squeeze of lime. very refreshing. sweet and savory. wonder if you add mint leaves, would that work? if I buy the prosciutto from Santi’s, do I still have to cook them, or reheat in microwave oven, just just eat straight from the vacuum-sealed containers? Instead of melon or cantaloupe try using mangga and avocado and if you like a little spice add a slice of jalapeno. And that my friend is a super tropical Italian wow.